AAHA-accredited VCA Paradise Valley Emergency Animal Hospital with 4 Board Certified doctors/Vets located in Scottsdale, AZ provide the finest care for your pet. The professional staff at VCA Paradise Valley Emergency Animal Hospital offers the highest quality emergency and critical case services with dedicated veterinarians, technicians and support personnel specially trained in emergency medicine who are on staff to care for your pet. Along with emergency care, they provide support services to assist your veterinarian in providing you with the best in veterinary medicine. The staff is committed to keeping you and your doctor informed and involved in the care of your hospitalized pet. The hospital want you to expect the highest level of service and care that your doctor entrusts in them. In partnership with your regular veterinarian Their goal is to provide high-quality, compassionate care for your pet. The caring and knowledgeable team of emergency veterinarians, nurses and support staff work hand in hand to care for your pet's emergency medical needs. All the staff/members of the hospital aware of how worried you may be about getting the care they need as soon as possible when your pets are hurt or ill. The doctors regularly attend continuing education courses and seminars to keep up with the latest in veterinary medicine. Your confidence is highly appreciated in allowing the hospital to care for your pet. 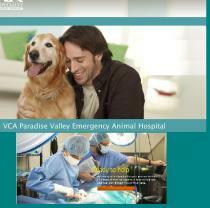 The doctors and other staffs of VCA Paradise Valley Emergency Animal Hospital are committed to caring for your pet�s emergency medical needs and keeping your trusted regular veterinarian informed and in the loop. A doctor and technician are available during their business hours to care for your pet's emergency medical needs. It�s their goal to provide the best possible emergency care for your pet. In every case, you'll be served by experienced, knowledgeable members of the staff. The veterinarians, veterinary technicians and staff of the VCA Paradise Valley Emergency Animal Hospital are trained in keeping with the highest veterinary standards.